On 15 January we got a visa. it was one of the most beautiful movement of the day. When we call the VFS helpline number to know the status of our application for VISA ,they said you have to collect from the VFS, When we reached to the VFS we both cross the fingers and collected the envelope, till we see the passport inside we were so nervous ,as we saw the visa stamp we were so happy to see it. Angchuk took me for the cold drinks and snacks. It was the happy movement for both of us. On 18th morning we reached at Delhi airport on terminal 3 for departure. When we reached at the Turkish airlines counter they tell us to show the hotel booking, we said we don't have, we have a invitation from our friend and then he ask for the identity of the invited person, we again said no ,we don't have. Then we show the invitation letter to them and they called somebody and finally they give us the boarding pass. Within five minutes announcement made by Turkish airlines, it says that flight will be delayed due to bad weather condition. It was delayed for 45 minutes and we relax and move towards the immigration. 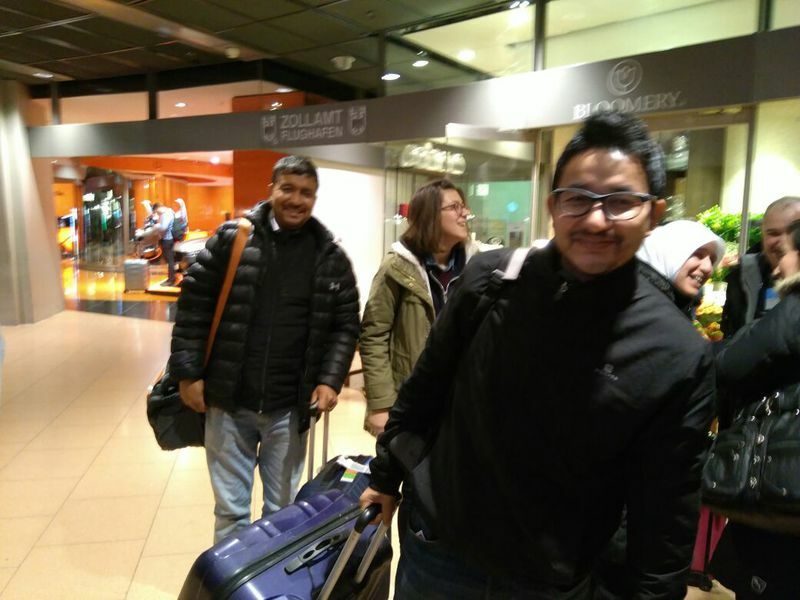 On 18th January evening we landed at Hamburg airport, it was too lucky that our flight land safely. Almost all the flights to Hamburg were cancelled because of the storm. When we land at the airport it was completely covered by a snow. As we get out of the airport Barbara was waiting for us out side. It was so happy to see her at airport. As we wake up at the morning, whole Hamburg was covered with fog and it was so cold, Temperature were around 1 degree Celsius. First day she took us around the Hamburg and the city was so clean and traffic system was so impressive. She explained us about the traffic rules and regulation while going to look around. On the first day she took us to the market, it was Tuesday and they have a special market where different varieties of vegetables, fruits and foods were displayed, and the vendors represented different areas specialty. It was wonderful and first impression of cleanness and hygienic. 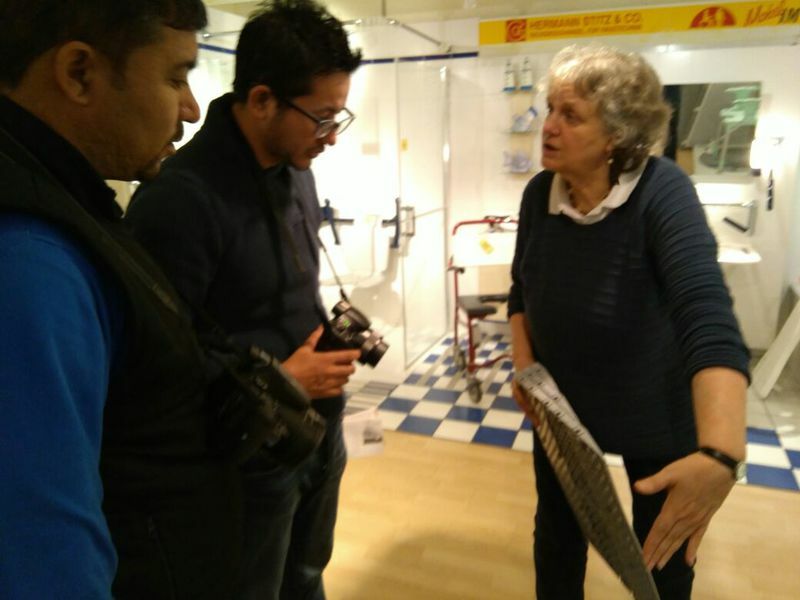 3rd day of our visit at "Barrierefrei Leben"
It support the people with disability in availing the product require for them to make easy and comfortable to perform their activity of daily living. This institute doesn't sell the product at institute, people who need the product need to come at the centre and identify the product and purchase it there. The products will change the life of a person with disability. Some equipment we have seen that can be use for creating a barrier free environment at institutional level and monasteries in Ladakh. We are in the process of making Matho Monastery accessible for all, I think some equipment like a stair lift can be installed at monastery without damaging the structure. This winter training was on a right time, there are so many products which we will install at our new Rewa comprehensive rehabilitation centre to create a barrier free institution. 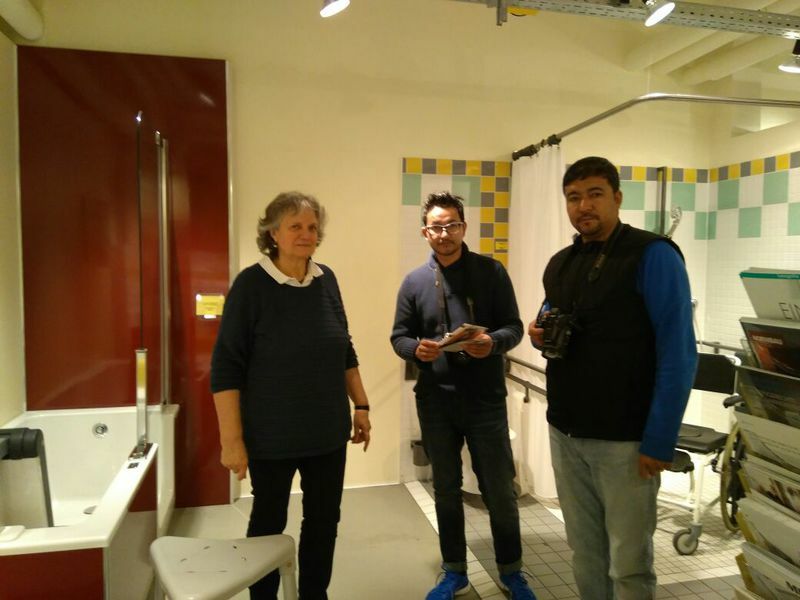 Visited to "Leben mit Behinderung Hamburg"
It is an place were people with disability are living (2nd home for them) here all age of people with disability are living together, but no one living living there is lazy, but everyone has a responsibility to do something on base on their interest. It was wonderful learning for us. It was unbelievable to see the products made by them. Look at the picture on right side, product are made from wasted paper, beautiful jewelleries. People with disability know their role and responsibility, and they have a schedule for the week, people with disability are working in internal and external environment, with a team leader. Some has to work outside to clean the surroundings, some has to work in crafts, some work on wooden art, and some work in market. The people where they live is not less then a hotel, it was so clean and all the facility, we were so impressed. Picture on the right side is a washroom with a bathtub. Excellent facility. We have learned so many things ,one day me might have the same for us, believe me. On 7th day we visited a school for children with disability. In this school ,children were divided in a group, like penguin group, elephant group ,dolphin group etc. It has all the facility for children. The idea of this school completely matching with our ideas. Juveniles were mainly focused with skill development and production of the products and sell it for the income. This is the only school in Hamburg city who is receiving this much of facility to the children with disability. One thing we learn is that they were teaching in a practical way ,e. g how importance it is for a child to know how much he need money to buy food. Inside the school there is a canteen, on very friday they sell food and all the children's come with money and they may to buy what they like; this way they will learn how much they need . The concept of giving knowledge is something very appreciable. We liked it. The workshop where elder children were working was so nice and informative, they are producing a good quality of bags, for very purpose, like they are making grocery bags, laptop bags, phone cover with different used cloths. Multidisciplinary team are involved in develop their skill. They have regular classes for them. This institute have a variety of facilities which include. therapy centre, swimming pool facility, sports room etc. A special walker has been introduced in Europe which is very effective and children using it very effectively, but very costly. Visited to a workshop were people with disability are working. On 11 day, we have visited a centre called Elbewerkstatten, where people with disability are working. We met with Ms. Faru Sonntag at her office. She explained us in details about their work. It was about one hour long as she explain to us everything through a PowerPoint and she clearified some points through flipchart. She was so nice and her assistant too. She will also give us the PowerPoint to use by translating in English. Later her assistant took us to the section where she introduced us to a man. He took us around and explain everything what they do. Big companies given them a task to complete, for that they are getting money. One of the task were packaging, companies giving them a unfinished product for packaging, their task is to put on the label, price and proper packing, and get it ready to sell in the market. A huge machinery was used by them, it was so amazing and unbelievable, look on the right side, a big machineries. They are making different products for big companies. Headquarter of kindergarten in Hamburg. We have visited three times at Headquarter of kindergarten. We met Dr Gabi, Mr. Desai, Ms, Frauke and Ms Bea. 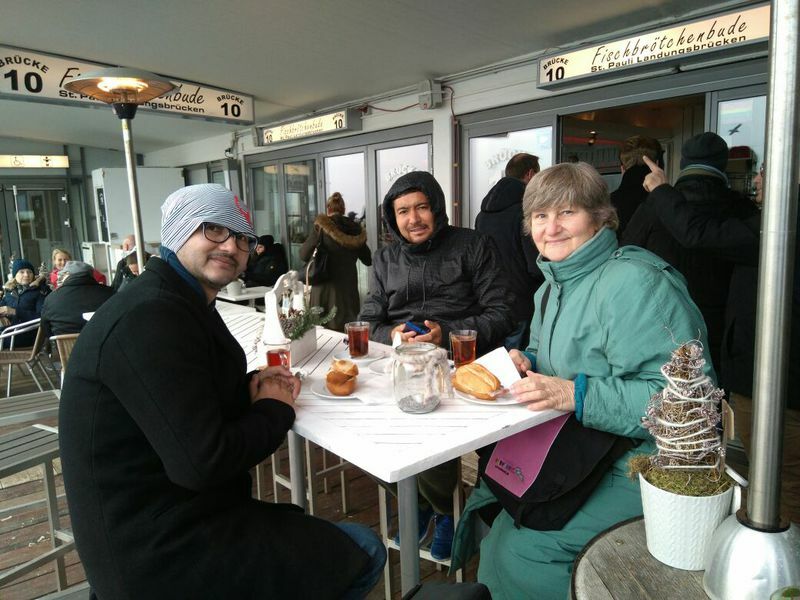 On 30th January we meet with Mr. Desai with a individual appointment, he explained about the kitas, how it works and who is controlling and so on. He had also show the organigramm of the company. He is the head of the company, he had given us little story books for the kids, he explained overall structure of kitas . 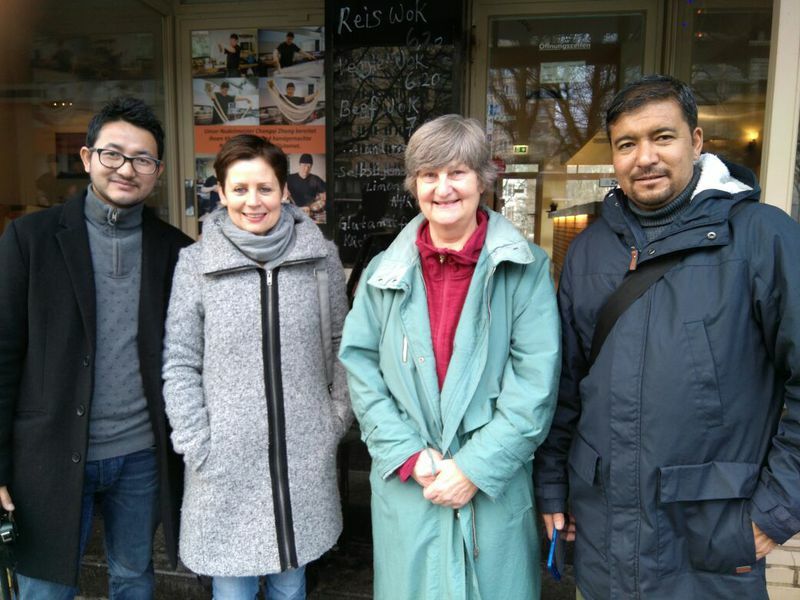 On 1st February I had an appointment with the managers of therapy pool, they have 120 technical staff working on kitas, there are thirty thousand kids receiving services from kitas of Hamburg. Out of 30000 kids, 1200 are special needs children. Both the managers of therapy pool showed us the methods of staff management, government policies for the staff and also explained about how effectively they used their staff at kitas and so on. I really enjoyed meeting with them. I hope that I can apply some of the methods at Rewa. It was nice meeting with him, he is a very sweet gentlemen, and down to earth. He introduced us to his colleague. He is working in a open space office. There was a leather factory long time ago. Owner modified it to a comfortable work station for the public, people can rent it for a small amount based on how long they will stay there. The owner providing a working table and chair with Wifi. During the exam time students hire this space. He took us to a café where he explained us about his work details and experience. He worked for a aircraft designer at the beginning, but after working for many year he left that because it was too difficult and to complete a one project it takes more then 10 years. So he decided to work as a building designer . We request him to support us in giving idea for our comprehensive rehabilitation centre; he replied vey positively. He will help us remotely whenever we need support from him. We offered to take him out for the dinner and he spent lots of time with us talking even though his wife was not well, she was waiting for him at home. We share our visiting cards and he drop us at bust stop. Stadthaushotel Hamburg: The most famous integration hotel of Europe! The words equality starts from here, this people with disability are doing their best and they are not far behind from others, nor other treat them so. they have a equal respect in the society . This Hotel is running with help of people with disability, when we enter this hotel, it was so welcome, they asked for the tea, water and coffee. They offered what we liked. All the maintenance of room, kitchen, restaurant are taking care by the people with disability, with full of responsibility and dedication. Mr. Herr told us that this hotel will be the only hotel in Europe, it is unique and its not making profit from it. Mr. Pietsch took us on a tour around and showed us the hotel rooms and facility. it was specially made for people with disability and elderly. Ms. Marlo, a physiotherapist, is willing to work for Rewa society and she visited us at Hamburg on Wednesday evening at Barbara’s home . We have give her a orientation about the Rewa society and Ladakh-Hilfe. I have shown her my PowerPoint presentation of Rewa society so she understands about Rewa society services and methods of service delivery. Barbara had also given a presentation on her role and responsibility. She was happy with presentation and we had dinner together at Barbara’s home. I made a Indian mix vegetable and rice. Ms. Marlo has also comes with a delicious dessert, Barbara also made a special dessert, all together we have a great dinner, we enjoyed a lot. 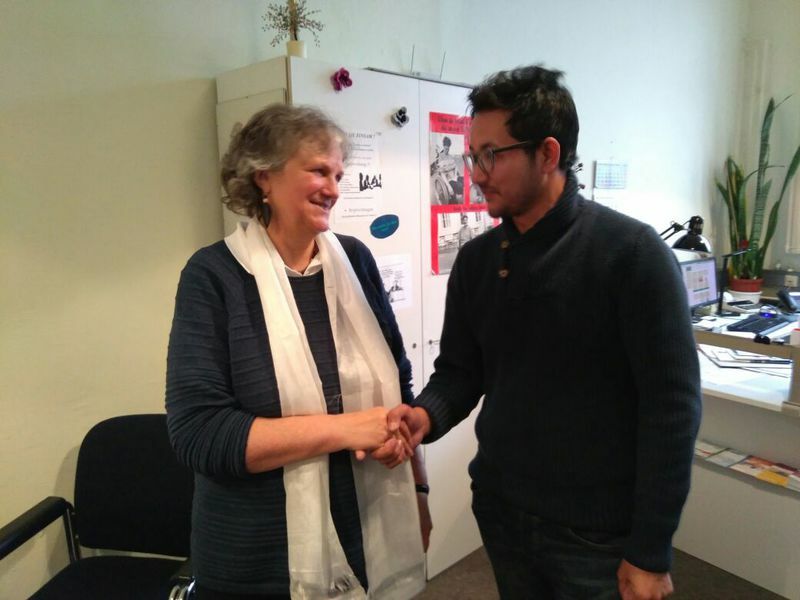 Ms. Marlo has retired from her work and she wants to work in Ladakh, this is her dream.